Global caustic soda capacity is poised to see considerable growth over the next five years, potentially increasing from 93.71 million tonnes per annum (mtpa) in 2018 to 98.65 mtpa in 2023, registering a total growth of 5%, led by Asia and North America, says GlobalData, a leading data and analytics company. The company’s report, ‘Global Caustic Soda Industry Outlook to 2023 – Capacity and Capital Expenditure Forecasts with Details of All Active and Planned Plants’ reveals that around 41 planned and announced plants are scheduled to come online, predominantly in Asia and Europe, over the next five years. Caustic soda capacity in Asia is expected to increase from 56.37 mtpa in 2018 to 59.96 mtpa in 2023, at an Average Annual Growth Rate (AAGR) of 1.2%. Among the countries in the region, China will add capacity of around 1.67 mtpa by 2023. Major capacity addition will be from the active plant, Xinjiang Zhongtai Chemical Company Urumqi Caustic Soda Plant, with a capacity of 1.10 mtpa by 2023. GlobalData identifies North America as the second highest in terms of caustic soda capacity addition in the global caustic soda industry, increasing from 16.25 mtpa in 2018 to 16.91 mtpa in 2023, at an AAGR of 0.8%. 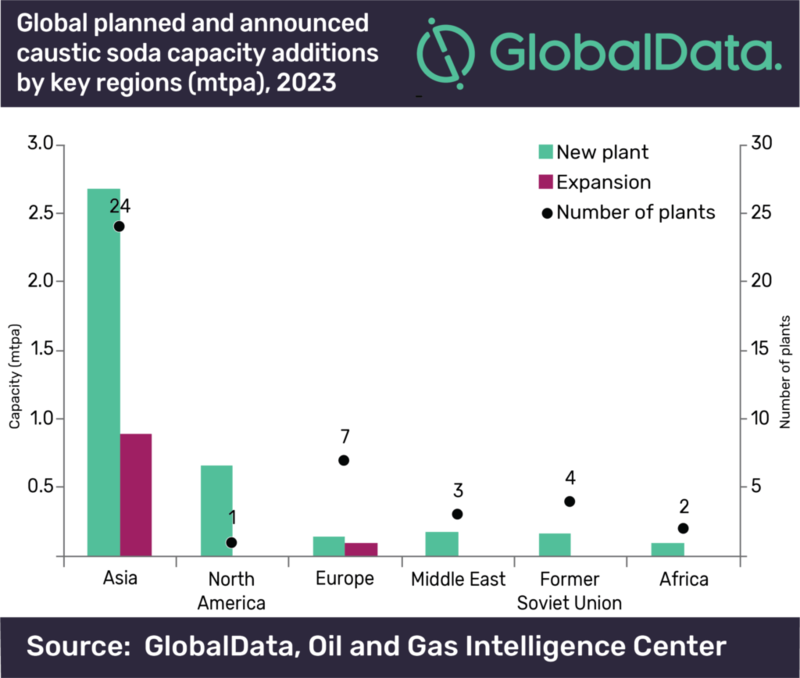 Most caustic soda capacity additions are from the US, with capacity of around 0.66 mtpa by 2023. Major capacity addition will be from the plant, Westlake Chemical Corporation Lake Charles Caustic Soda Plant, with a capacity of 1.36 mtpa by 2023. Within Europe, caustic soda capacity is expected to increase from 12.55 mtpa in 2018 to 12.80 mtpa in 2023, at an AAGR of 0.4%. Among countries, Spain’s capacity will add around 0.18 mtpa by 2023. The Middle East will be the fourth highest, increasing from 33.04 mtpa in 2018 to 3.22 mtpa in 2023, at an AAGR of 1.2%. United Arab Emirates leads in the Middle East, contributing around 0.18 mtpa by 2023. Major capacity addition will be from the plant, Shaheen Chem Investments Abu Dhabi Caustic Soda Plant, with a capacity of 0.13 mtpa by 2023. Caustic soda capacity in Former Soviet Union (FSU) is expected to increase from 2.15 mtpa in 2018 to 2.32 mtpa in 2023, at an AAGR of 1.5%. Turkmenistan is forecast to be the top country in the region with capacity additions of 0.08 mtpa by 2023. Xinjiang Zhongtai Chemical (Group) Co Ltd, Shin-Etsu Chemical Co Ltd and China National Salt Industry Corp are the top three companies globally in terms of planned and announced capacity additions over the outlook period. The report also states that the three highest planned and announced global caustic soda capacity addition plants in the outlook period are ‘Xinjiang Zhongtai Chemical Company Baicheng Caustic Soda Plant’ in China, ‘Shintech Plaquemine Caustic Soda Plant 3’ in the US, and ‘CNSG Qinghai Chlor-alkali Chemical Company Haixi Caustic Soda Plant’ in China with capacities of 0.80 mtpa, 0.66 mtpa and 0.36 mtpa, respectively.